My rural land photography work recently took me to Cloudcroft, New Mexico, which is about 30 minutes east of Alamogordo. It is a small mountain town, almost like a place you might think is hiding up in the Alps in Switzerland. The town has a lot of charm and while there I stayed at The Crofting Inn B&B. The is where I met Penny, the 18-year old dog. 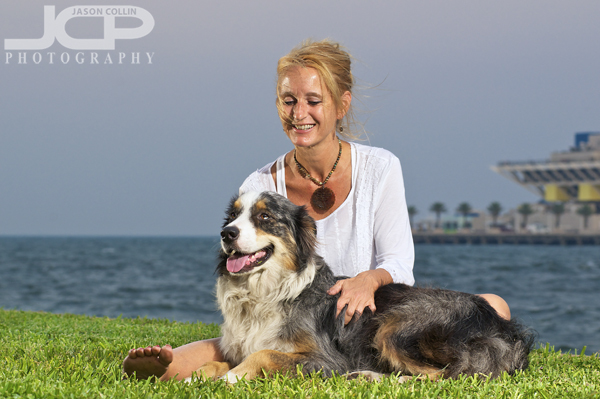 Beth & Logan in Vinoy Park for their human & pet portrait session - Nikon D300 Nikkor 80-200mm @ f/7.1 ISO 200 1/100th Strobist: SB-800 @ 1/2 power to frame right SB-600 @ 1/4 power to frame leftOn a blustery evening I met long-time dog park friend Beth and her Australian shepherd Logan for a dog and human candid portrait session. As I have written about before, it is much different when working with a client you already know, in fact I would go so far as to say it is nearly totally different. We started out with The Pier and Tampa Bay as the background. Candid pet portrait with Beth & Logan dog - Nikon D300 Nikkor 80-200mm @ f/7.1 ISO 200 1/60th Strobist: SB-800 @ 1/2 power to frame left SB-600 @ 1/4 power behind benchNext we went over to the bench with the best view in all of downtown St. Petersburg. From it you can see the entire downtown skyline with a fantastic sunset view on most evenings. Logan, however, was much more interested in passing inline skaters than the view! Candid smiling pet portrait with Beth & Logan dog - Nikon D300 Nikkor 80-200mm @ f/7.1 ISO 200 1/60th Strobist: SB-800 @ 1/2 power to frame left SB-600 @ 1/4 power behind benchIt was way, way too windy to use any light modifiers besides a couple of diffuser caps on my speedlights. For this shot I placed one on a lightstand to frame left and the other on a tripod directly behind the bench. I used my trusty Nikkor AF ED 80-200mm f/2.8D lens for all these shots. The wind though did have one benefit, that being keeping temperatures very tolerable and actually rather comfortable, even for me shooting and scurrying about setting up the shots. Beth & Logan all smiles in Vinoy Park - Nikon D300 Nikkor 80-200mm @ f/5.6 ISO 200 1/100th Strobist: SB-800 @ 1/2 power to frame right SB-600 @ 1/4 power to frame leftIt was a lot of fun to make these photographs for Beth and Logan. By nature a portrait session including a dog has to be candid so for me it was just a matter of getting my lights where I wanted them and letting Beth enjoy spending time with Logan and pushing the shutter. 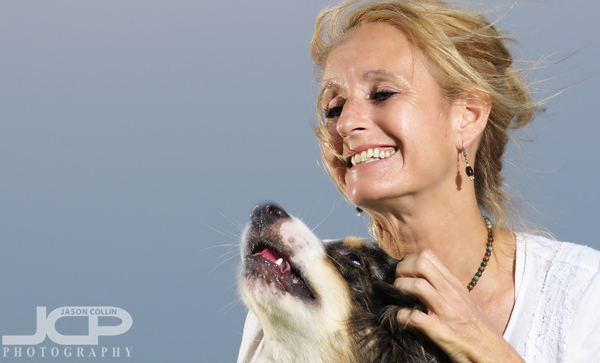 Reserve a candid pet photography session for you and your dog best friend today! 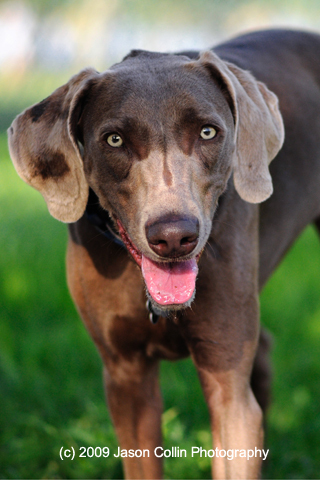 It's a hard dog name to pronounce, and I'm not even sure I can say it right still, but a weimaraner is certainly and interesting and unusual dog to me. Try this free iPhone wallpaper and you can have this weimaraner's piercing eyes staring back at you every time you turn on your phone! Have a weimaraner and would like him/her to be photographed like this? Please visit the PET section of this website.